John McLuckie built many of the biggest ‘brick and stick’ warehouses in early Vancouver. There ought to be a lot of information about him – he was in the city for over 40 years, but there’s very little material in the records, which perhaps reflects his status as a builder in the society of the time. There aren’t even any photographs of him in the archives – just of the buildings he built. He was born in New Kilpatrick, Dumbarton, Scotland as John Mcfarlane McLuckie, (often inaccurately written as Macfarlane) in July 1860 (and almost certainly not July 1862 as the 1901 census says). His father was William McLuckie, his mother Jane Leitch. From the 1891 census we know he was Presbyterian, and by 1901 he was married to Annette, a Catholic born in France, and they had a 6 year old son, Robert. In all the census records John is listed as a contractor. The City Directories tell us where he was living. In 1888 he was living at the Greyhound Hotel on Water Street. So was James McGhie, initially recorded as a carpenter, later a contractor. McGhie and McLuckie built the Town and Robinson block on Carrall Street in 1889. 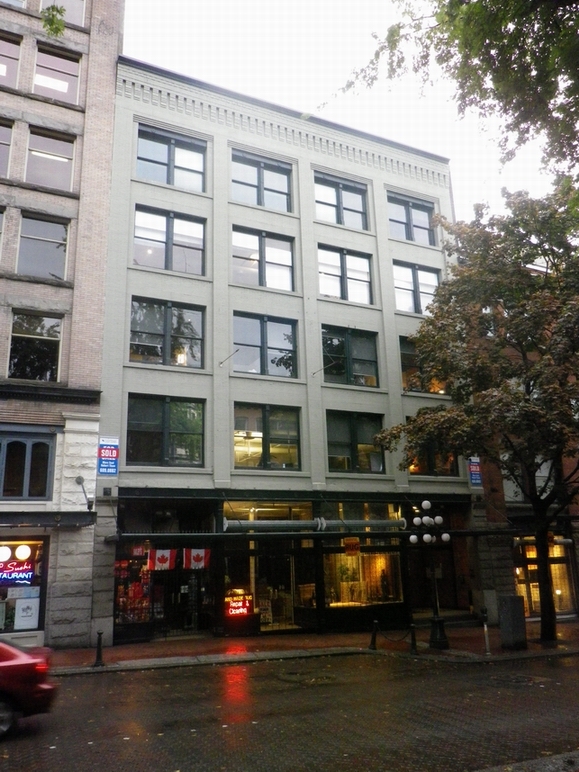 In 1891 James McGhie was occupying the former partners premises at 614 Hastings Street, and John McLuckie has moved to the Occidental Hotel on Water Street. In 1893 McLuckie built the extention to the new Court House with Edward Cook, located where Victory Square is today. In that year he was living at 818 Cambie Street. In 1896 he moved to live at 75 W6th Avenue in Mount Pleasant, where he lived for over 30 years, still being listed there in 1926, the year before his death. 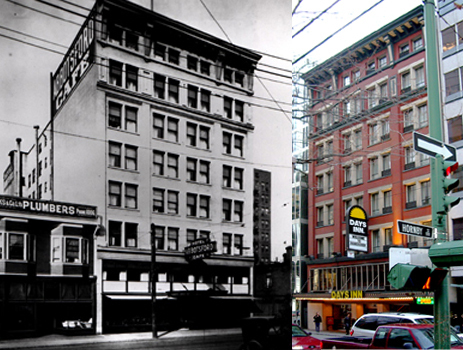 In 1901 he built the Greenshields Building on Water Street and BT Rogers’ house ‘Gabriola’ on Davie Street. He completed the massive Refined Sugar Warehouse for Rogers’ BC Sugar refinery in 1902 (a five year job), and in 1903 he completed a warehouse at 353 Water Street. This was occupied by the W H Malkin company, and the heritage notes on the building say that McLuckie owned it and the Malkins leased it. In 1904 he built the King Edward High School (the city’s first) at Oak and 12th – which burned down in 1973. He built the McLennan & McFeely warehouse (these days called Koret Lofts) in 1907, the various additions to the massive Kelly Douglas Warehouse (these days The Landing) on Water Street from 1907 to 1913, The Metropole Hotel (as the Traveller’s Hotel) on Abbott Street in 1910, the Fleck Brothers building on Powell Street, which he may have designed, also in 1910, the eastern half of the Malkin Warehouse (which some sources say he also designed) in 1912. In 1915 his business premises were on Pender Street, and in 1918 he built the Abbotsford Hotel where his yard had been located. No architect is associated with the building, and the building permit (for $70,000, obtained in 1911) says he designed and built it himself. He remained owner of the hotel until his death and it was sold by his son in 1929. It still stands today as the Days Inn Hotel, missing from the city’s Heritage Register but still a fine example of a 90+ year old building. The Abbotsford Hotel seen 2 years after it was built in 1918, and in 2004. His son, Robert also developed a building known as the McLuckie building, and sometimes as the Inns of Court Building, designed by Townley and Matheson in 1931 and located at the corner of Howe and West Georgia Streets. 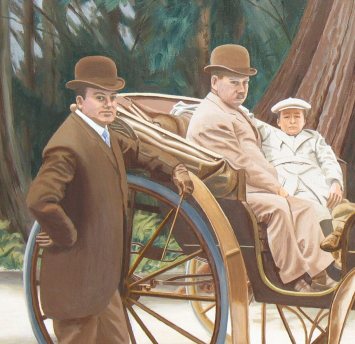 His grandson, Bill McLuckie is a talented painter, and this is a part of a painting by him showing his grandfather (in the centre of the picture) with B T Rogers standing on the left. This entry was posted in Downtown and tagged Abbotsford Hotel, J M McLuckie, McLuckie Warehouse by ChangingCity. Bookmark the permalink.